At the time of writing the Article I am afraid to say that the Mars has reached the Eclipse point of 4 degrees of the Solar Eclipse of the 22nd August 2017 and can work like a Ammunition Dump. Venus will pass through these 3 nakshatra and will produce most venomous results in the sign of Leo from the 4th Sept. to 6th Oct. 2017 Karka for Prices. Jupiter will not pass through these nakshatras , But in the Present context Atichari and Volatile results even after it Joins Libra on the 12th Sept. 2017 at 06-51 hrs. , since on the Sun will join Virgo on the 16th Sept. 2017 . Sun will Go in Sagitarius on the 15th Dec. 2017 Hence till this Date Jupiter will be atichari and will give Volatile results . Jupiter is supposed to be weak in Libra since it cannot Exhalt in this sign and will pass through the nakshatras of Mars , Rahu and Jupiter . Jupiter is Benefic from the Moon Natal in the 2nd, 5th, 7th, 9th and the 11th house . Jupiter Transit in Libra will be as Follows as per Murti- Nirnaya Taurus, Sagitarius, and Cancer Swarna Murti and Hence Best for Sagitarius Moon sign . For Aries, Gemini and Virgo Moon sign hence for all the 3 Very good and Rajata Murti. For Pieces, Scorpio, Capricorn Tamra Murti. Not very good . For Aquarius , Libra, Aries , Good for Aries and Aquarius but least benefic since Loha Murti. Saturn Fallen and Retrograde from 21st June 2017 to 25th August 2017 and Stationary from 25th August to 30th August and the Fallen and direct till 26th Oct. 2017 when it joins the sign Sagitarius at 19.30 hrs. Saturn will be in Ketu nakshatra from the evening of the 26th Oct. 2017 to 4th March 2018 and can prove most Venomous , Specially for all activities which happened during the Stationary time of Saturn from 20th August to 30th August 2017 . For Saturn ingress in Sagitarius I have already written an Article “Roman God Saturn Transit In Sagitarius : Boon or Bane” link https://www.astrodocanil.com/2016/11/roman-god-saturn…ius-boon-or-bane/ dated 23rd Nov. 2016. The Planetary Positions in the above chart are Forming a Kaal Sarpa Yoga and almost all the Planets are in Mars and Saturn and Called the Aroha Kal Sarpa Yoga and Explosive in the Present Scenario specially when the Planets are also in the 5 Eclipsed nakshatras . 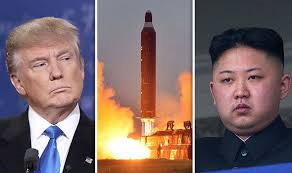 There is a Rajyoga for North Korea of 9th and 10th Lord Moon and Sun and Amavasya Yoga for Scorpio Lagna but in the Aroha Kaal Sarpa yoga which can have a very explosive effect on the Country as well. ← Honeypreet ‘Papas Angel’ Disappeared from Rohtak On 25th August 2017: What Stars Foretell ?